Cosmic Fortune Slots | Win 5 Jackpots & Bonus Games! Choose one of five coin values (£0.02, £0.05, £0.10, £0.20, £0.50). Set the maximum bet or the number of autoplay spins that you’d like and then click the spin button with rotating blue arrows to start the game. 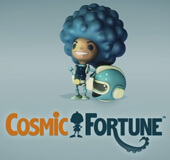 Cosmic Fortune™ was released in early 2015 by NetEnt. The game set a new precedent for prize winning possibilities by offering players the opportunity to win 5 different Jackpots. Of the 5 jackpots, 3 of these are progressive, so the cash amount you can win is extraordinarily high. Cosmic Fortune Slots is absolutely loaded with incredible features including Wild Substitutes, an Avalanche Feature, Free Falls, 2 incredible bonus games and a fabulous jackpot game. Cosmic Fortune is a 5-reel, 3-row, 15- line video slot. The graphics and theme in this game are totally out-of-this-world and incredibly hi-tech. The game play is absolutely seamless and packed with entertaining sequences that keep players totally engaged. In order to activate the Free Fall feature, players must land 3 scatter symbols. When the Free Falls Bonus Game is activated, players have the chance to win coins or to activate the incredible Jackpot game. The Jackpot game features a spaceship that drops marbles from the top of the screen. If the marbles hit the target 3 times the player can win one of the 5 jackpots. 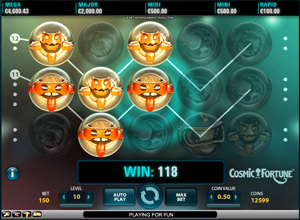 Overall, Cosmic Fortune Slots is a sensational new online slot game for 2015. NetEnt truly produced an incredibly high quality product that is sure to keep players satisfied.